Joining the World Health Organization and the US Bone and Joint Decade the Hong Kong Chiropractors' Association seeks to focus attention on the burden of spinal disability and help educate adults and children to improve their spinal health. 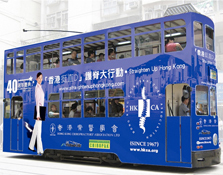 The HKCA has commissioned a Hong Kong Tram to promote this initiative! The HKCA is offering presentations in English and/or Chinese to businesses; professional, civic and charity groups; and schools. Just contact us to arrange a date. The Straighten Up Hong Kong initiative is important for very pressing reasons. Increasingly in this technological age, individuals are experiencing greater levels of spinal discomfort and disability related to stress and poor posture. Many people commonly work and play in cramped, awkward, slouched postures. The resulting back pain compromises the quality of our lives. Every year back pain results in tremendous costs related to health care fees and diminished individual income and productivity. Recent studies indicate that training school children in beneficial postural habits and exercises can be helpful in facilitating postural improvement. This is very encouraging as many children spend long hours of school and recreational time in stooped awkward postures that have been correlated with poor spinal health in several studies. Other recent research indicates that the spinal health of adolescent students has been worsening over a ten-year period. To combat this trend just as the dental profession educated and empowered the public to care for their dental health daily, the HKCA is now launching this initiative to educate, empower and mobilize the public to “Straighten Up” and care for their posture and spinal health daily. Straighten Up is a worldwide health initiative geared to improve the posture, structural development and self-esteem of our youth and all of our citizens. The vision of Straighten Up is very simple: we envision a day when everyone performs a short enjoyable spinal exercise module daily just as we brush our teeth. Straighten Up includes healthy lifestyle recommendations aimed at markedly reducing the alarming rate of obesity in our children. Originally a chiropractic initiative from Life University, Atlanta Georgia, USA, Straighten Up was developed and endorsed by multidisciplinary health care professionals, fitness experts and leaders of the World Health Organization and the United States Bone and Joint Decade. Straighten Up has garnered a number of accolades from health and fitness leaders including Lee Haney, past chairman of the US President's Council on Physical Fitness and Sports. Lee describes the program as “awesome” with “vision and much promise”. In January of 2005 Tommy Thompson, then US Secretary of Health and Human Services, “commended” the individuals who developed “Straighten Up” for their “leadership in the field of spinal health”. The United States Bone and Joint Decade is a prominent partner with Straighten Up. This prestigious research and educational initiative, created and empowered by proclamation of the President of the United States, has adopted Straighten Up as its spinal health promotion program. The HKCA wants to insure that our children learn good spinal health habits, by regular performance of the Straighten Up exercise module and adoption of its healthy lifestyle recommendations. To date, Straighten Up has received excellent reviews in every venue in which it has been presented. These venues include the U.S. House of Representatives Wellness Center; the U.S. Bone and Joint Decade Meeting at the National Institutes of Health; the American Public Health Association annual meeting; and the Healthier US Fitness Festival sponsored by the President's Council on Physical Fitness and Sports. Dr. Jose Carlos Martines, coordinator of the Child and Adolescent Health and Development Cluster of the World Health Organization (WHO) promotes Straighten Up. Currently multiple language translations of "Straighten Up" are being developed to begin global implementation and habituation of the initiative in collaboration with the WHO. We encourage children and all of our citizens to practice the Straighten Up Hong Kong exercises for better spinal health. Why not give them a try? You will feel and look better with better posture. If you have disorders, which limit movement, check with your doctor before attempting these activities.